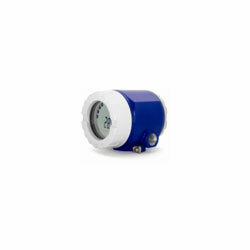 The Model RTT20 Intelligent Temperature Transmitter receives input signals from RTDs, thermocouples, ohms sensors, or dc mV sources. It transmits a 4 to 20 mA output (with no remote communications), a smart version with HART communications, or an intelligent version with software selectable 4 to 20 mA. Remote communication and database configuration is provided by a hand-held communicator, a PC-based configurator, or an I/A Series System. One Unit Configurable for all T/C, RTD, mV, Ohm, and Dew Point Inputs. Custom Inputs can also be accommodated. Available as a Basic Unit, or in Aluminum or 316 ss Enclosure. Enclosure is Explosionproof and meets NEMA Type 4X and IEC IP65.